On a board reading [8h][4h][3h], Lee Hirsch shoved all in and Rohit Hukmani quickly called. Hukmani turned over [8c][8s] for a flopped set. Hirsch turned over [6d][6s]. The [jc] turn and [qd] river would send Hirsch home in 8th place. Rohit Hukmani raised to 55,000, Aaron Barham shoved all in, and Hukmani quickly called. The board ran out [7h][2d][2s][qd][4c] eliminating Barham in 10th place. 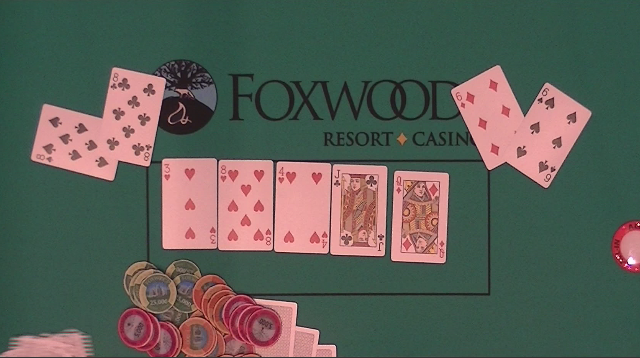 There were five to see the flop in an unraised pot. All five checked when the flop came [7s][5c][4c]. The small blind checked the [7d] turn, the big blind bet 4,000. 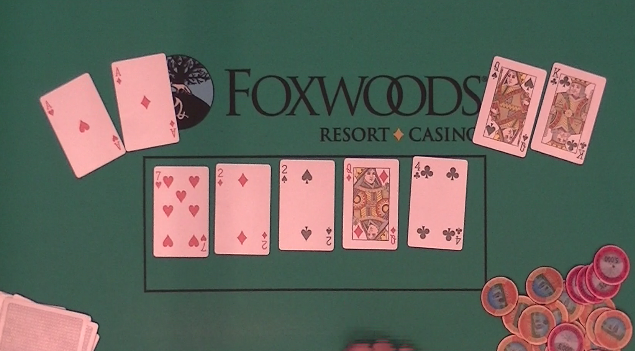 Chris Korres called in the hijack and the small blind also called, the other two players folded. When the [8c] came on the river, the small blind led out for 9,000. The big blind called, as did Korres. The small blind announced, "straight," but didn't show his cards. 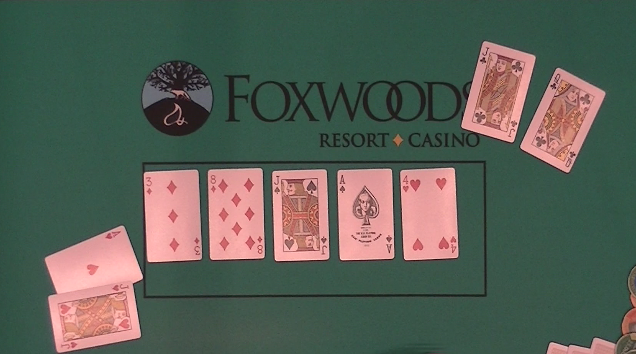 The big blind turned over [10c][3c], but Korres turned over [qc][jc] for the higher flush. Korres took down the pot and is now sitting with 175,000 in chips. Average is 75,000. On a board reading [3d][8d][js] Michael Dobbs checked in the hijack, Randy Spain bet 95,000 in the cutoff, and Johnny Lau shoved all in on the button. With action back on Dobbs, he reshoved for more and Spain released his hand. The [as] on the turn and [4h] on the river assured Dobbs would take down the hand and Lau was sent home in 12th place. 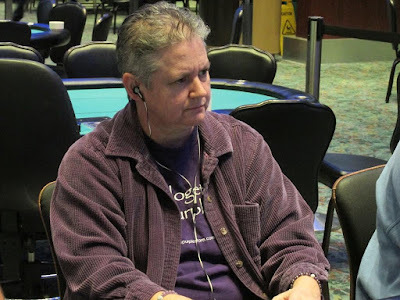 Linda Swears was all in holding [ah][8h] against her opponent's [6d][6h]. When the flop came [qh][6c][3c], her opponent moved even further into the lead after flopping a set. But Swears turned a flush draw when the turn came the [2h]. Unfortunately for Swears, the [10s] river did not bring the flush and she was sent home in 21st place. In a blind versus blind situation in which both players had nearly even playing stacks, the player in the small blind is all in showing [js][jd] against Tarun Gulati's [qd][qh]. The board ran out [kd][8c][7h][8h][2c] awarding Gulati a full double up and sending his opponent home. He is now sitting with over 500,000. There were 113 entries in Event #16 ($400 NLH Big Stack Freezeout). The total prize pool for this event is $38,363. A player in middle position raised to 2,000 and Gerald Aiello called in the small blind, as well as the player in the big blind. Both blinds check-called a bet of 3,000 from the player in middle position when the flop came [ad][js][4d]. All players checked the [kh] turn. When the river came the [10h], Aiello bet out 11,000. The big blind folded, and the player in middle position tank called. Aiello turned over [as][qd] and the player in middle position mucked his cards face down. Haralambos Saridis shoved all in from under the gun. Dayo Ajao shoved all in for less in the cutoff, and the player on the button called both of the all-ins. Saridis had a commanding lead holding [qd][qh] against Ajao's [8h][8c] and the button's [9d][9c]. When the flop fell [ad][8d][ks], Ajao would take the lead with his set of eights. The [6d] on the turn gave Saridis a flush draw, but Ajao was still in the lead. 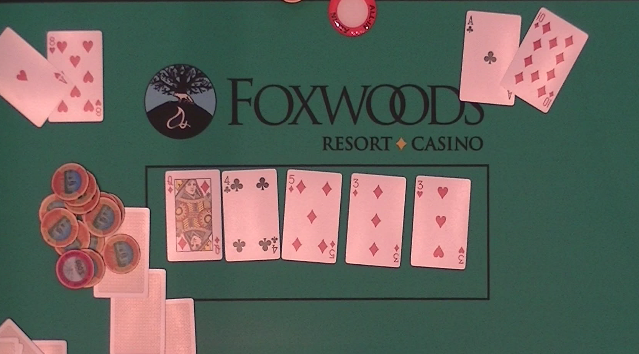 It wasn't until the [7d] came on the river, where Saridis hit his flush to triple up. Ajao was eliminated and Saridis chipped up to 140,000. 36 players remain as we close in our final table of today’s event. Brad St. Vincent shoved all in from under the gun. Joseph Corey shoved from middle position for less. All other players folded. The board ran out [qd][4c][5d][3d][3h]. Corey doubled up to 90,000 and St. Vincent was left with around 90,000. Byeongwook Kang raised to 9,500 under the gun and a player re-raised to 35,000 on the button. Kang called. Both players checked the [qh][7c][3d] flop. When the [8c] came on the turn, Kang bet 31,500, and his opponent shoved all in. Kang went into the tank and talked aloud to himself about the hand. "I have ace queen. We either chop or you have kings here. " He continued to talk aloud and after nearly two minutes he eventually called. Kang turned over [ad][qs]. His opponent said, "Good call," as he turned over [jd][jc]. The [kd] on the river did not improve his opponent's hand and he was sent to the rail. Kang is now sitting with 130,000 in chips. There were 390 entries in Event #15 ($400 NLH Multi-Flight - PPC). The total prize pool for this event is $112,404. On a board reading [as][3s][10h][2s], Michael Bagdasarov checked, Chris Tryba bet 19,000, Bagdasarov raised to 45,000, Tryba shoved all in, and Bagdasarov snap-called. 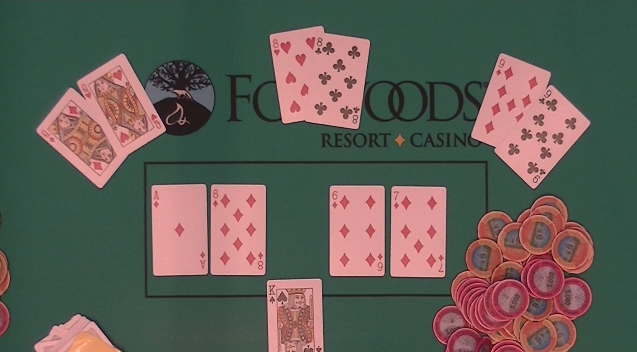 Bagdasarov turned over [ks][10s] for a flush. "Nice hand," Tryba said as he turned over [ac][2c], having turned two pair. He would need the board to pair on the river. But the [4d] came on the river, and Tryba was sent home in 46th place. A player in the hijack raised to 9,000 and Matthew Wantman shoved all in from the small blind. The hijack called. The board ran out [ad][kh][5h][qh][8c] awarding Wantman a full double up. "I just got really lucky," Wantman said after the conclusion of the hand. He is now sitting with 180,000 in chips.